I guess I’ve never yet shared a self portrait of mine here. Ah, why not? There’s always a first time for everything, right? 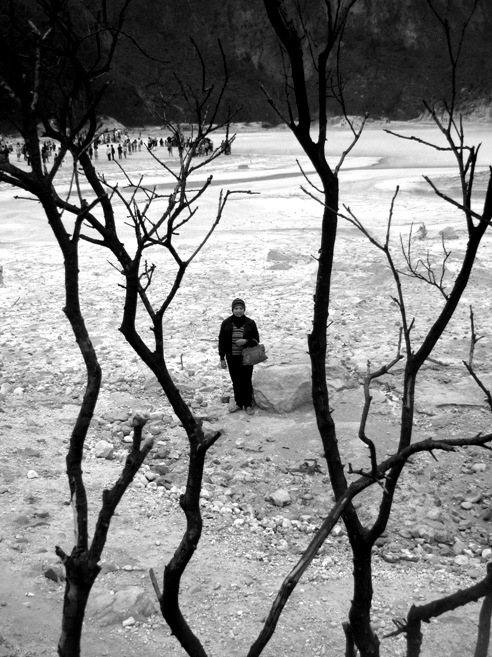 My husband captured this while we’re visiting the Ciwidey White Crater (Southern Bandung, West Java, Indonesia). Beautifully framed. I do like this. Interesting perspective with you in the middle ground and a crowd of people in the background. If the ground starts shaking, run. Nice picture, exquisite composition in B & W. Greetings. Yes, there is always a first time... Great shot! Great shot. Fantastic dramatic landscape and nice seeing you in it. I traid for a long time the same, but now I dont care. I like how the tree frames you. The crater is very interesting too. Adorei as pessoas ao fundo. Um abraço!